Two airplane crashes that changed Missouri politics come to mind today. We covered both of them. Please be forgiving if this piece grows long. Memories and stories of unfulfilled possibilities are not easy to relate briefly. This Wednesday, October 20, the State Historical Society of Missouri has the premier showing of a new documentary, “The Jerry Litton Dialogues.” It will be shown in the Ellis Library Auditorium at the University of Missouri. October 20th also is the tenth anniversary of the funeral of Governor Mel Carnahan. Thousands of Missourians have their own memories and perspectives of these two great political tragedies—and they were great political tragedies regardless of whether you favored or opposed both men. It’s kind of sobering to realize that people in their 40s are too young to know how important Jerry Litton was or how innovative his “Dialogue With Litton” programs were. Based on what friends at the society have told me, the documentary will provide that perspective. Political campaigns and the campaign use of the media to manipulate the public are so radically different today from what they were in Litton’s time that there might develop a feeling that campaigns were gentler then. That is not the case. 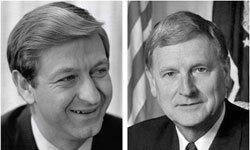 Political campaigns were tough and campaigns for high office were often matches between two heavyweights in big-time battles. The techniques were much different. But do not assume that Jerry Litton versus John Danforth was not a very hard-fought campaign. Jerry Litton was 39, incredibly charismatic, a two-term member of the United States House of Representative, a skyrocketing star of the Democratic Party who had his eye on the presidency. In fact some people already were putting green bumper stickers (similar to those he’d used for his congressional campaign) on their cars reading “Litton for President.” And Jimmy Carter, who was the presidential candidate that year, did say that he thought Litton would be President of the United States one day. John Danforth also was 39—he turned 40 a month after Litton died–and was a two-term Attorney General who had led Republicans back into prominence in state politics and whose office became an incubator for young and aggressive fellow Republicans who would make their careers later, including Christopher Bond and John Ashcroft. Danforth’s deep voice and serious straight-talking demeanor won over a lot of voters. Litton had money. He and his father ran a nationally-recognized Charolais cattle farm near Chillicothe. Danforth had money. His family was part of the Ralston-Purina business empire. But Litton had a media savvness unseen in Missouri politics. He began holding town hall meetings long before town hall meetings were widespread in politics. He gathered hundreds of people together in his congressional district and he brought in leading political figures from Washington and chatted them up then let the audience question them. Before long the town hall meetings, which were recorded, edited, and then televised in his district, gained popularity outside his district because of the newsmakers he had on the shows with him. And when he ran for the Senate, Litton re-edited those shows and had them shown on TV throughout the state. Although they were considered public affairs programs, there was absolutely no doubt what their purpose was. The Missourinet was covering its first election on August 3, 1976. Litton was staying in Chillicothe but planned to attend a victory party in Kansas City when the results came in. Litton faced tough primary opposition from Congressman Jim Symington, the son of the retiring senator whose open seat had generated this contest, and from former governor Warren Hearnes. Many felt Symington was the favored candidate. But Litton rolled up 45% of the vote. Hearnes finished second with 26%. Symington could only achieve third, with 25%. Danforth dominated the Republican race. We got a report in our newsroom—time has erased how we got it—that there had been a plane crash at the Chillicothe airport. We immediately feared what the news might become. But as we made our phone calls it became clear it was the plane taking Litton to Kansas City. One of our calls wound up getting through to the ambulance driver who had taken the bodies to a hospital. He confirmed there were no survivors. Democrats nominated Warren Hearnes to replace Litton on the November ballot. Danforth posted a sizeable victory. Several days later I was talking to Alex Netchvolodoff, a top Danforth aide. He told me that Danforth was not sure he could have beaten Jerry Litton even though Litton had spent ninety percent to his liquidity in his primary campaign. Danforth, as I recall, was going to respect some campaign financial limits. Litton had the capacity to raise enormous amounts of cash for the general election and no doubt would have done so. Missouri politics were altered for years when that plane crashed on August 3, 1976. Maybe national politics, too. There might not have been a Senator Danforth for more than eighteen years. The Democratic Party under the influence of Jerry Litton undoubtedly would have been significantly different. Who knows what the products of the Danforth Incubator would have gone on to achieve? Might there have been a Reagan-Litton presidential race? Or a Litton-Bush 41? What course would Bill Clinton have followed if Jerry Litton had achieved his goal of reaching the White House? Iffy history, to be sure. But when the crankshaft broke on Paul Rupp’s plane that night as it was taking off from the Chillicothe airport, all of us were left with a lot of “What ifs” that the passage of time have only magnified. The Historical Society’s documentary will remind us of several things, no doubt, but one of the things it will remind us of is what could have been. The same is true of the Carnahan plane crash on October 16, 2000. The Carnahan-Ashcroft contest was another heavyweight slugging match between two distinctly different people. Ashcroft had the upper hand as an incumbent U. S. Senator. But Carnahan relentlessly ate into Ashcroft’s advantage and had closed the gap three weeks before the vote. Here is where the story turns a little personal. My son, now an airline captain, was a flight instructor at the Columbia airport then and Mel Carnahan was learning to fly. One afternoon he showed up at the airport, wanting to get some flight time and wanted to fly to Hermann, where he would meet his wife, Jean, and their Highway Patrol security person who would take them on to a fund-raiser in St. Louis. Carnahan couldn’t fly alone at that time so Robert rode along on the flight to Hermann. When they got to Hermann, Carnahan invited him to join them for dinner at a restaurant in town. The four of them went to a little German restaurant that evening, enjoyed dinner, and took Robert back to the airport to fly back to Columbia while the Carnahans went on to St. Louis. The evening made a huge impression on a young pilot, who was making cargo flights in New York State in October, 2000. October 16, 2000. My wife, Nancy, and I were in Albuquerque, having just finished an archaeological project in the Mesa Verde area, when we saw a local television report that the airplane carrying Missouri senatorial candidate Mel Carnahan was missing on a campaign flight. A quick switchover to CNN updated situation. The plane had crashed and there were no survivors. An immediate call to the newsroom found Brent Martin and the rest of the news staff already at work. “Find Roger Wilson,” I told them, and have somebody stick with him.” Wilson, the lieutenant governor, would be a key figure and he and the people around him would be the immediate source of information as events unfolded. Brent alreayd had sent one of our reporters to Jefferson County and our affiliate in the area was feeding us information. Our company founder, Clyde Lear—a former newsman–also was in the newsroom and he was the person given a recorder and told to find Wilson and stick with him. Brent said later that he realized just before starting the first newscast that morning, at 5:55, that he would be the one telling thousands of Missourians who had been asleep all night that their Governor was dead. He felt the weight of that responsibility as he started that broadcast. Nancy and I grabbed a few hours of sleep and then started a drive from Albuquerque straight through to Jefferson City. Fifteen hours and 996 miles later we were at home and the next morning all of us were consumed by the planning for the funeral, the short-notice preparations for a broadcast, asking and getting answers to numerous questions triggered by the situation—what would Ashcroft do (he suspended his campaign during that week and had to face refocusing his campaign to run against a dead man and the public reaction to the death); could someone be appointed to run in Carnahan’s place (no, it was too late); would Carnahan’s name stay on the ballot (yes, the ballots had been printed); who would take his place in the Senate if he won (Wilson said he’d nominate Jean Carnahan); how would we deal with the Secret Service, which had started taking over the funeral plans because both President Clinton and Vice-President Gore and dozens of members of the U. S. House and Senate were going to attent (one Carnahan family aide told us the Secret Service was “being very secret and not being of much service.”); how to cover the visitation at the Governor’s Mansion; who to interview’ what questions to ask–and more. The reporter’s professional stoicism cracked at that moment. Briefly. Some time later I met the man who had hosted the party for Carnahan before the fatal flight. He told me that Carnahan had mentioned at the party that the polls were showing he had pulled ahead of Ashcroft for the first time. But, again, a plane crash had altered Missouri politics. Would Carnahan have held on to the lead he felt he had achieved in the hours before his death? If he’d been elected, there would not have been the election in 2002 that saw Republican Jim Talent, the loser of a close race for governor in 2000, defeat Jean Carnahan to serve the remaining four years of the term. Would Bob Holden have defeated Congressman Talent for the governorship in 2000 if John Ashcroft’s Senate campaign had not been suspended and altered in the closing weeks, something that could have lifted Talent on the Ashcroft coattails? Would Matt Blunt have run for Governor in 2004 if Jim Talent had been Governor? Would Auditor Claire McCaskill have run against a strong Governor Talent in 2006, as she ran against a weakened Governor Holden and beat him in the primary only to lose to Blunt in a campaign that set the political stage for her to run for the Senate in 2006 for the seat that Mel Carnahan would have held since 2000? And what would Jay Nixon have done? Or what if the campaign in 2000 had played itself out between Carnahan and Ashcroft with Ashcroft the winner? Would he have become Attorney General? Would he still be a U. S. Senator, now serving his third term after being re-elected in 2006? Could our choice for the presidency in 2008 have been Obama and Ashcroft? Would Robin Carnahan in 2010 be trying to keep the fire from going out? Two plane crashes. Lives were lost. Lives were changed. The history of Missouri—and the nation—was altered. Mel already had his license. (whereas in the story it said he was learning to fly….but he had his license for quite a while before that) I was just riding along to take the plane back to Jeff City while he ate and would then ride home in his Governor Van. He just wanted to fly over there, do a few touch and go’s and eat and catch a ride home. Well, after dropping off the Governor, the plane wouldn’t start. A 1960’s technology fuel injected Aircraft engine when hot sometimes has vapor lock trouble and I just couldn’t defeat it and that’s when they invited me along to go eat with them. It was a very nice time. Very nice people. A very nice Chicken Cordon Bleu. A few weeks after that flight, I left to move out East and fly cargo. When I started class for the company, I learned of the crash. A classmate said, “Didn’t your governor just die in a plane crcash?” I said, “Nooooo…I just flew with the guy…..”. Then I called home and found out.